SAPPORO - Hiroshima Carp right-hander Hiroki Kuroda gave a phenomenal performance in what could be the final outing of his storied professional career in Tuesday’s Game 3 of the Japan Series against the Hokkaido Nippon Ham Fighters at Sapporo Dome. 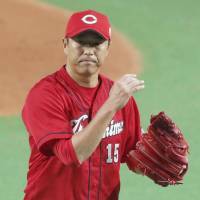 The 41-year-old went 5⅔ innings, allowing four hits and one run in 85 pitches in Hiroshima’s 4-3 loss to the Fighters, with fans clad in red replica Carp jerseys and caps flying miles from their Hiroshima homes to support him. At the end of the day for Kuroda, it doesn’t mean anything if his team doesn’t post a win. Carp first-year reliever Jay Jackson said that Kuroda’s attitude has been “exactly the same” since he announced last week that he will retire at the end of the Japan Series. While Kuroda claimed that Tuesday’s game was just another game, it wasn’t that way for the Carp and Kuroda’s fans. According to reports, TV ratings in Hiroshima averaged 59.6 percent (It was 17.5 even in the Kanto area). The average ratings for the first two games at Mazda Stadium made it just north of 50, but Kuroda’s potential final start helped boost it to near 60. Kuroda is a calm, humble player and not a man of many words, which creates an aura that his fans embrace. But his teammates appreciate what he has brought to the team, which this season captured its first pennant in a quarter of a century. Jackson said that the Osaka native is “the heart and soul” of the team and has brought so much positivity. Meanwhile, Kuroda, a career 203-win pitcher between Japan and the majors, has inspired other clubs, not just his own. The Fighters’ Shohei Otani, NPB’s latest superstar who is 19 years younger than Kuroda, came up with a pair of doubles off Kuroda and was the last Fighters hitter he faced before the hurler left the hill with a leg injury in Game 3. Otani, a two-way player, said that he cherished the opportunity to learn from the outgoing Kuroda at the plate. Whether Kuroda, who had a 10-8 record with a 3.09 ERA this year, is completely finished or not will depend on how the Series plays out, and he may still have a chance to still pitch as a reliever. Staff writer Jason Coskrey contributed to this story.